McFarlains is just one of the great places to grab a great meal in Branson! When it comes to picking a place to eat, it’s always best to ask a local. They know where to find the best burger and how to get into the most exclusive restaurants. Branson, Missouri restaurants are no exception. If you head to the strip you can find yourself dizzy with options to choose from. That’s why we put together this list of the 10 best places to grab a bite in Branson. Read on to learn how to satisfy your cravings! If you have a big appetite, then you will find yourself in heaven with the oversized pancakes at Billy Gail’s Cafe. The restaurant may only be open from 7 a.m. to 2 p.m. But during that small window, customers swarm the restaurant to indulge in biscuits covered in thick gravy, as well as savory omelets and stuffed french toast. If breakfast isn’t really your thing, the cafe also offers an extensive lunch menu of club sandwiches, homemade soups, tasty burgers, and delectable salads. Make sure you bring cash if you go. Billy Gail’s Cafe doesn’t accept card payments. If you have a hankering for barbecue, then Danna’s Bar-B-Que and Burger is the place for you. This family-owned joint is loved by locals and visitors alike. They serve up some of the best-smoked meats and fall-off-the-bone tender ribs. Their secret recipe has been perfected. Chefs slow smoke the meat over hickory wood for 12 to 14 hours to achieve the perfect texture. The barbeque sauce itself is also carefully crafted. You’ll find yourself craving it long after you’ve returned home. If farm-to-table dining is your goal, then you will love the Keeter Center at the College of the Ozarks. Everything used in the restaurant has been raised right on campus. Locally sourced ingredients are combined in exciting ways by the students at the college. This is one of the Branson, Missouri restaurants that you can be proud to spend your money at. Everyone who works at the restaurant is a student of the university. Make sure you make a reservation if you plan on coming for Sunday brunch, as it can be difficult to get a seat. If you are going to see an IMAX movie, or if you are just looking for a tasty meal, then McFarlain’s Family Restaurant is a wonderful place to check out. Make sure you start with their cornbread that is served with a delectable honey butter. Then, move on to the crispy country fried steak or try one of the local fish on the menu. If you are visiting the Highway 76 strip, then Mel’s Hard Luck Diner is a place you must stop. With a fun 1950s theme, this diner serves up American favorites like milkshakes, burgers, sandwiches, and wraps. The only thing better than the food is the friendly staff. If you’re lucky, your server may even break out in song. With over twenty years of experience, Mel’s Hard Luck Diner is an experience with incredible live entertainment and the most enticing entrees around. If you want old-fashioned cooking, look no further than Grandma Ruth’s. 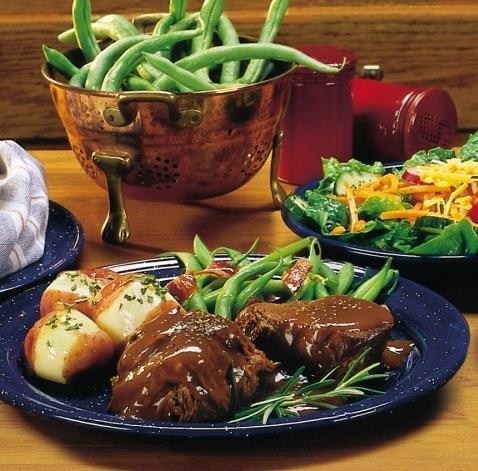 With friendly servers and high-quality ingredients, it is a must try place for all new visitors to Branson. Make sure you try the gooey cinnamon rolls. You can customize them by choosing from a variety of different frostings including cinnamon, caramel, toffee, apple, cherry, butter, chocolate hazelnut, or cream cheese. If you come on the right day, you may be able to catch some live music and enjoy a down-home experience to remember. At Level 2 Steakhouse, you can have a fine dining experience paralleled by none of the other Branson, Missouri restaurants. With its convenient downtown location inside the Hilton Branson Convention Center, this steakhouse is a great place for a romantic date or for entertaining business clients. Finish up a day of shopping at Branson Landing by sinking your teeth into one of Level 2’s 28-day aged corn-fed beef sourced locally in the Midwest. Their commitment to sustainable dining includes locally grown produce and Heritage Missouri pork. If you find yourself looking for Branson, Missouri restaurants in the historic downtown area, then the Branson Cafe is a classic and beloved option. Recently featured on The Travel Channel’s The Zimmern List, the restaurant has been serving up family favorites and comfort food for more than one hundred years. This no-frills eatery has satisfying service and tasty breakfast dishes like chicken fried steak, pancakes, and hash browns. If you have a sweet tooth, you will also enjoy their freshly baked pies and over-sized cinnamon rolls. And with the affordable prices, the Branson Cafe is a staple you can’t miss during your vacation. Another one of the best Branson, Missouri restaurants on the strip is Cakes-n-Cream. This one-stop destination has awesome pizza and burgers, as well as ice cream sundaes and funnel cakes. With a classic 1950s theme, this dessert parlor is a welcoming place to enjoy some old school jukebox tunes and your favorite ice cream flavor. Try visiting after you see one of the world-class shows in the area. If you’ve had enough home cooking and you are ready for an ethnic experience, then Thai Thai Cuisine is the best choice for you. They have traditional Thai entrees like Pad Thai and a variety of meat choices from chicken to pork, beef, and tofu. The dishes are packed with flavorful spices like curry, ginger, and chili paste. And make sure you leave room for dessert because they have excellent fried ice cream. With a romantic interior, the ornate decorations take your meal to the next level. You’ll find yourself swept away by the rushing backlit waterfall and delicate dishware. Dining in Branson Missouri is world class. There are many ways to experience Missouri cuisine – and beyond! In addition to food, the city of Branson also has a lot of other things to offer. If you’re considering visiting, check out everything there is to do in this fun and exciting city.